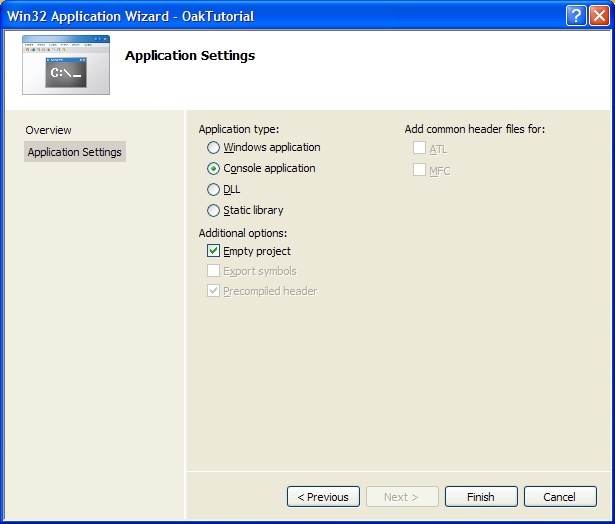 This document aims at learning user to use the Toradex OakLib programming library to communicate with their Toradex Oak sensors under Windows. A Toradex Oak sensor. In this tutorial we will use the Oak Pressure sensor, but with a few adaptations, any Oak sensor can be used. A computer running Windows XP or Windows Vista. 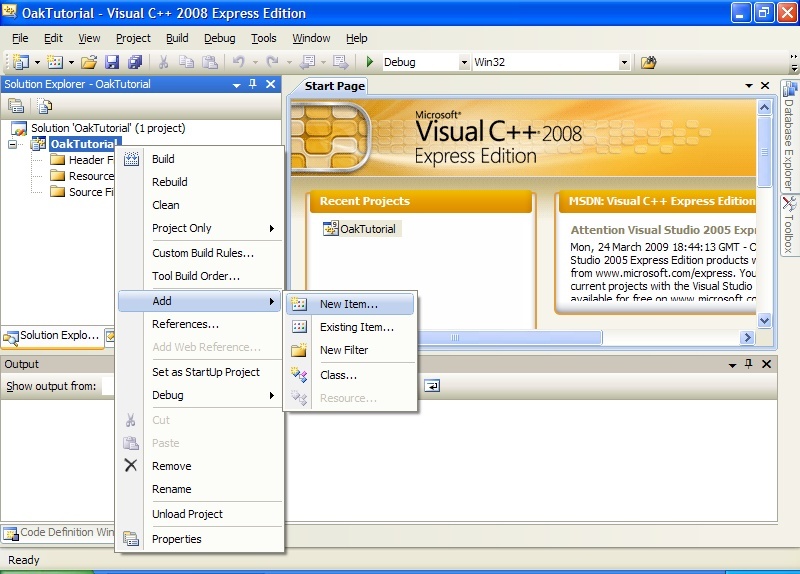 Visual C++ Express, version 2008 or above: this is the free version of the popular Visual Studio development environment. You can download it at no charge directly from Microsoft website. 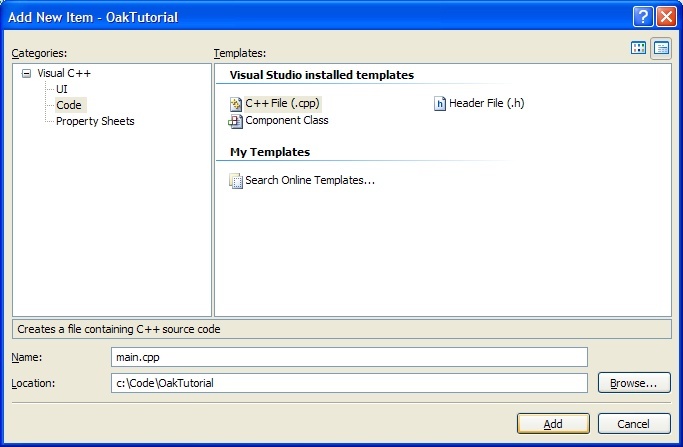 If you have other versions of Visual Studio, you should have no problem following this tutorial. A good knowledge of C++. We will not use much of the additions of C++ to C, so C programming should be able to follow this tutorial. Some experience with using the Microsoft Visual Studio environment. If you have never used Visual Studio, you should start by reading some dedicated documentation. A copy of the Toradex OakLib library, the Oak Programming Guide and the datasheet for your Oak sensor. You can download these from the Oak page on the Toradex website. Before we start, Make sure that you have installed Microsoft Visual C++ Express 2008. We will use this version because it is a free version of the Microsoft Visual Studio Development environment, which is the most widespread development environment for Windows. We will spend most of our time in Visual C++ Express, so if you have never used it, it is probably a good idea to start by learning how to use this environment. The free Express version of Visual C++ has some limitation, but they are not problematic for this tutorial. In the first part of the tutorial, we will create a new Visual C++ project, set up the OakLib library, and write the simplest Oak useful Oak application possible: a command-line program that reads the state of the device at a regular interval and display the read values. Note: you can select a different location that suits you better. In this tutorial, we will assume that you selected C:\Code. Once done, click Finish. You now have created a new empty project. It is time to add a source file to this project. In the Solution Explorer, right click on the OakTutorial project, then select Add → New Item. Fill the dialog that appears as indicated in the screenshot below. Once done, click the Add button. 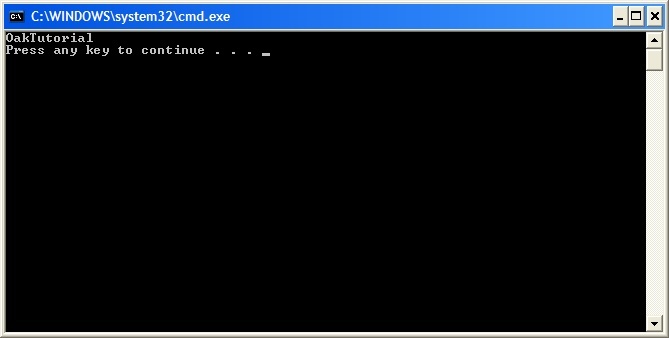 enter the ASCII folder and copy oaka.dll and oaka.lib to C:\Code\OakTutorial. The oaka.dll file contains the actual code of the library functions that our application will use. The one we have copied is the ASCII version (as opposed to Unicode version that is also part of the archive). The oaka.lib file is a library file that will allow Visual C++ to link our code with the functions of the OakLib library. Tell the compiler that we want to compile our code without Unicode support. To do that, right-click on the OakTutorial project in the Solution Explorer window, then select Properties. 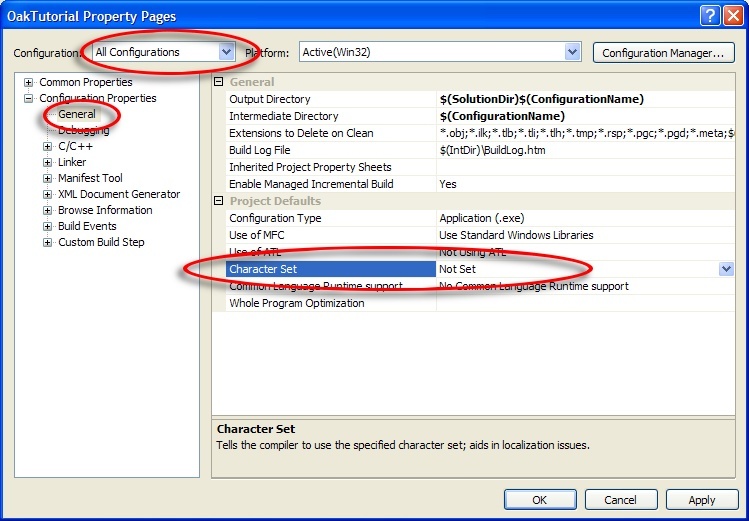 In the dialog that appears, first set the Configuration to All Configurations, then browse to the Configuration Properties → General page, and the value of the property Character Set to Not Set, as illustrated in the figure below. Do not close the dialog yet. Tell the linker to link our program with the OakLib library. 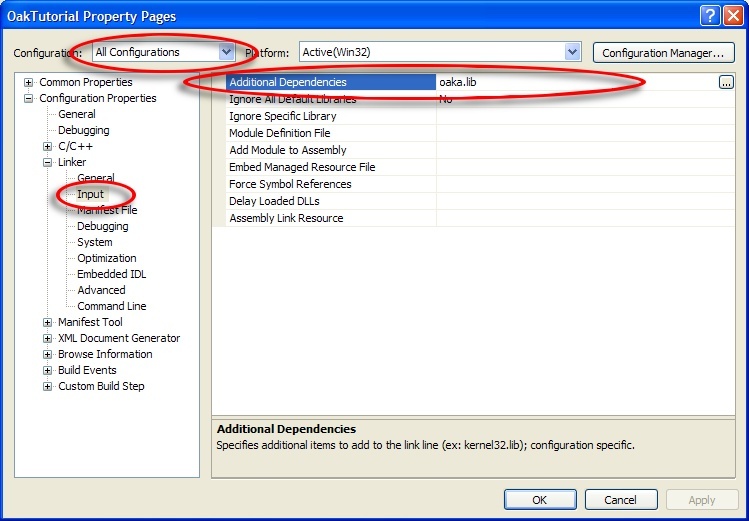 In the project properties dialog, with Configuration set to All Configurations, go to the Configuration Properties → Linker → Input page, and set the Additional Dependencies property to oaka.lib. Click the OK button to close the dialog. Our project is now properly configured to use the Oak library. The 7 first parameters are the search criteria: USB PID (each sensor type has a fixed USB product ID), revision ID, serial number, Device Name, User Device Name, Channel Name, user channel name (we will discuss channel and device names later in this tutorial). If you do not want to use a search criterion, just set its value to 0. The last parameter, SensorFound, is a pointer to a structure tOakSensor that is defined in the oak.h header file. If a sensor matching the search criteria is found, the function will return true, and SensorFound will be filled with information about the sensor. If no matching sensor was found, the function will return false, and the content of SensorFound will be undetermined. This simple program use Oak_FindSensor() to locate a Oak P sensor, and if it finds one, it display some of the information available in the sensor structure. The first byte (byte 0 - GNS) of the feature report indicates whether we want to set or get the value of the LED Mode. The second byte (Tgt, for target) indicates whether you want to set / get the parameter in the RAM or in FLASH memory. If you set the parameters in RAM, it will only be used until your device is powered down (by unplugging it or shutting down your computer). When you plug you device again, the LED mode will be reverted to the value that is stored in Flash memory. So if you want the setting to persist, set the target value to Flash. The 6th byte allows you to specify the LED Mode you want, and of course, it is not used when you set the value of GNS to Get. The DevicePath parameter is the path of the device, which can be found under the name DevicePath in the sensor structure returned by Oak_FindSensor(). ExpectResult should be set the true if the function should be waiting for a reply from the device (which mean it should be set to true for if the operation is 'Get' and false if the operation is "Set". One important note regarding the RptBuffer: the first byte of the report must be set to zero, which is the report number. The actual feature report should start at RptBuffer. If you are expecting a reply, the content of the reply will be in the RptBuffer parameter upon function exit (provided the function completed successfully and returned 'true'). The actual data is starts at RptBuffer, as RptBuffer is the report number and RptBuffer is an operation code that is set of 0xff if the operation was successful. If you are expecting a multi-byte reply, the format is little-endian, meaning the least significant byte have the lowest index in the buffer. The Oak USB architecture allows for report rate (the rate at which the device sends a report containing its current status, known in USB lingo as an "Interrupt In" in report. ranging from 1ms to 65535 ms. The lower limit of 1ms is imposed by the USB protocol. The sensor itself has a sampling rate, which can be different from the reporting rate. The limits of the sampling rate depend on the type of sensor and can be found in each device's datasheet. Sample Rate: the sample rate determines the rate at which the sensor performs data sampling, in milliseconds. Report Rate: the report rate determines the rate at which the device sends sampled data to the computer, in milliseconds. After sampling (the default mode): a report is sent every time the sensor performs sampling. In this mode, the report rate is ignored. After change: a report is sent after sampling only if the sampled values are different for the last sent values. In this mode, the report rate is ignored. Fixed rate: the sensor performs sampling using the specified sample rate and sends report at the specified report rate. If you are unsure, use 'After Sampling'. Each of these feature report are documented in the sensor's datasheet, and all sensors types use the same report, so it is easy to write functions for setting/getting the sample rate, the report rate and the report mode. There are many other feature reports available, some are common to all Oak sensors, and some are specific to a certain type of sensors. Using the example we have just studied and your device datasheet, you should have no problems using these feature reports. It's now time to read the actual sensor state! Sensor state is send at the rate specified by the setting with have just modified (every 100ms), using a report called Interrupt In report. There are two options for reading the interrupt report: Oak_GetInReport() or Oak_GetCurrentInReport(). This function is blocking and will not return until the next Interrupt In report is received (or until the specified timeout has elpased). InReportLength is the length of the report. Use 33. Timeout_ms is the number of milliseconds after which the function will return false if no Interrupt In report has arrived. As you see the execution time of this function is dependent on the sample and report rate selected, and may not be appropriate for GUI application unless you have several threads running. The 3 parameters have the exact same meaning as for the Oak_GetInReport(), and the only difference is that this function is non blocking (hence the absence of the timeout parameter): it returns immediately the last report that was received. Picking one variant or the other really depends on the needs of your application. With this we can easily write a function that read the Oak P Interrupt In report. Note that as usual, the report data starts at index 1, as the byte at index 0 is the report number. /// format specified for the report in the device's datasheet, chapter 3.1. /// it wraps around every 2048 milliseconds. // print the values, carefully taking care of the units specified in the datasheet. This conclude this tutorial. 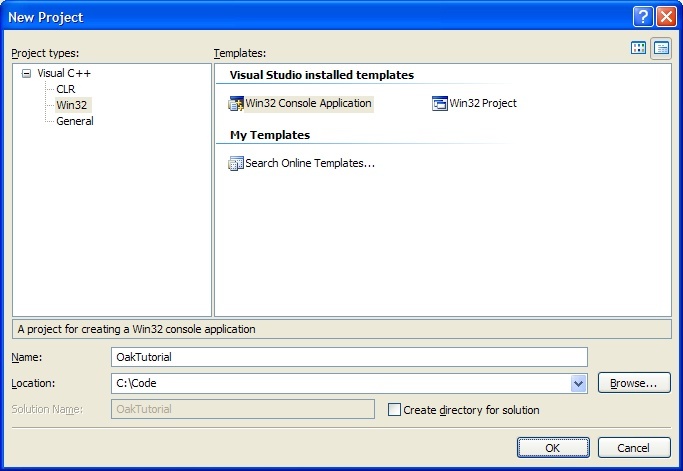 You can download the complete solution folder for Visual Studio 2008.